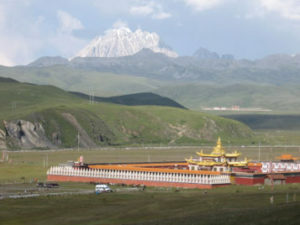 A temple outside of Lhagang, Tibet. Syllables in the Mandarin language all use one of four active tones, or a fifth ‘neutral’ tone. So, what is the sixth tone? Far from being a new linguistic addition to Mandarin, the Sixth Tone is a state-market hybrid news outlet created to spread Communist Party-approved viewpoints with a bit more subtlety than they normally employ. Combined with a web-savvy design, it’s part Ministry of Truth and part Vox.com. Chinese media pieces on Tibet normally conform to one of a small number of recognizable tones. 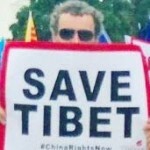 There are pieces that rage against the so-called Dalai Clique, pieces where Party cadres resolutely broadcast the Chinese government’s positions and slogans, and pieces that crow over purported evidence of progress in Tibet- the ‘happy, dancing Tibetans’ motif that Chinese media outlets have repeated for decades. One long-running problem is that these narratives have little appeal for people who have access to international media; essentially, this style of propaganda only works in a news vacuum. Enter the Sixth Tone. In an attempt to find something less tonally off-putting for foreigners, the creators of this new site craft pieces that focus on telling personal stories while removing the broader political context that the Communist Party doesn’t like people to hear about. This dynamic is very much evident in an article they published earlier this week about life in Lhagang, a small town in eastern Tibet. 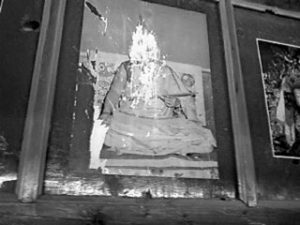 A portrait of the Dalai Lama defaced by Chinese police in neighboring Ngaba prefecture, March 2008. The article touches on lithium mining in Tibet, too, and here the author swerves to avoid mentioning that it was none other than the town of Lhagang that made international headlines last year when Tibetan villagers staged a sit-in protest to demand an end to mining in the area. Chinese authorities responded by dispatching armed police in riot gear. This wasn’t the first protest to take place in Lhagang; in 2008 Tibetans scaled a cellular tower next to the town and flew a Tibetan flag from the top. 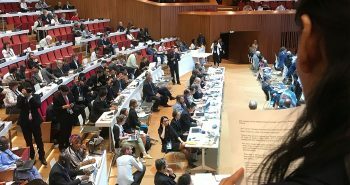 Sixth Tone’s snappy content and light touch makes it potentially much more palatable to a foreign audience, an audience that generally dislikes the strident tone of traditional Global Times or Xinhua-style propaganda. We should take note of the way they frame these issues, though. 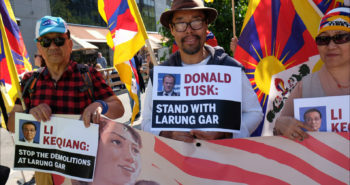 Serious problems created by Communist Party policies are reduced to personal choices, with no mention made of government diktats that force Tibetans to put their safety (and all too often their lives) at risk when they protest poisoned rivers or display photographs of the Dalai Lama. For a publication that claims to “highlight the nuances and complexities of today’s China,” their dedication to glossing over issues and ignoring vital pieces of context seems noteworthy.